Blaine “Cannonball' Richter of Grande Prairie, was the repeat Rocky Road Race winner in Taylor, Sunday. He out sprinted Colter Young for the win in the 36 km., 2 lap event with a time of 1:07:00 hours. Pat Ferris was third at 1:17:19. Gary Hilderman was 4th at 1:22:31, Peter King 5th at 1:22:37 and Roger St. Jean 6th at 1:24:00. Kendra Young won the 18 km 1 lap event with a time of 41:47 minutes. Barb Polehoykie came in 10 seconds later. Bob Andrews was third at 42:55. Jolea Bilodeau was 4th at 42:59 and Rod Lewis 5th at 46:34. The Rocky Road Trophy Race was held on the gravely and muddy Peace View road. 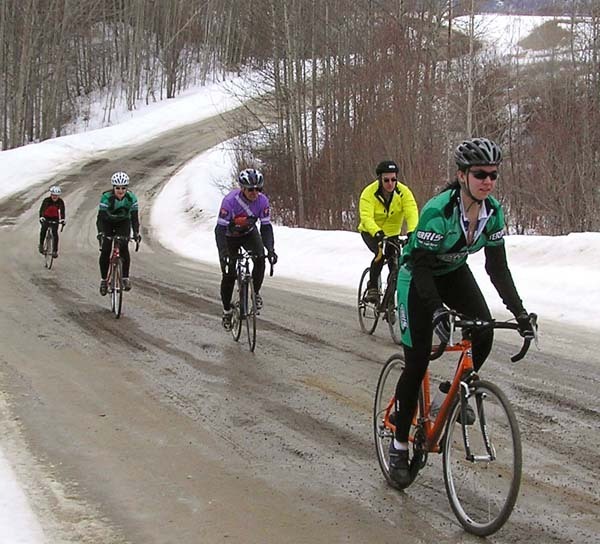 Eleven riders started out going through the muddy and snowy lower road section, progressed to the 2 km 10 percent gravel hill and then the gentle climb to the tee in the road. From then on it was a swift decent to the bottom. Colter Young and Blaine Richter left Pat Ferris on the lower half of the uphill. Colter Young pulled away from Blaine on the hill on lap 2, gaining about a 30 second lead. Richter pulled back up to Young on the gentle climb to the tee. The two then descended the hill and headed to the finish with Blaine Richter holding off Colter Young's late charge. Ferris rode the race virtually by himself with Peter King chasing. Gary Hilderman eventually caught King and the two rode together to the finish with Roger St. Jean chasing. Despite being covered with mud and grit from head to toe, all riders enjoyed the event. The Spring Stage race and first 2 races of the 2009 challenge Cup Series. -Race #1 - Thursday Baldonnel time trial at 6:15 pm.